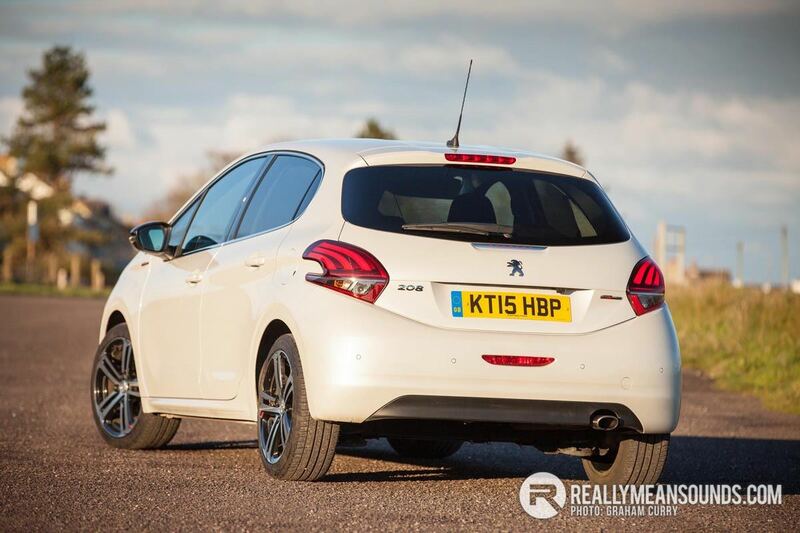 We recently received a little gem from a French manufacturer in the form of a reasonably practical Peugeot 208 GT-Line. When the 208 range was launched a couple of years ago I was lucky enough to get a drive in one of the first GTi models that came into Northern Ireland and it impressed greatly, so with anticipation was keen to get driving this latest model. The 208 is a very smart looking car indeed and this test model was enhanced with its pearl white paint (£645 option) which glistened in the sun beautifully while the front and rear lights wrap around to the side of the cars lines in harmony. 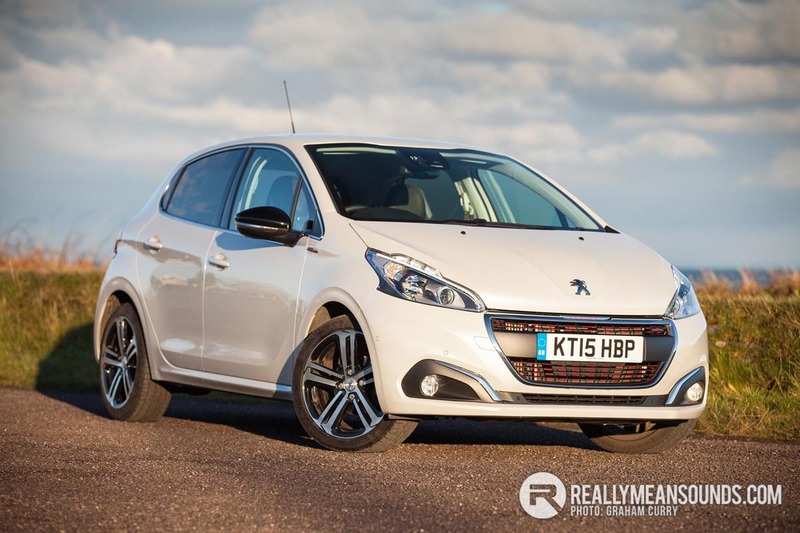 This particular test car looks much bigger than many Peugeot 208’s but this is an illusion on my mind simply as this model is a five door and as such the extra doors make it look much bigger than the more common three door models. With its 17inch alloy wheels wrapped in Michelin’s finest rubber, GT-Line badging and red detailing around the outside this small hatchback delivers a sporty feel along with having a reasonable road presence over a base model 208. 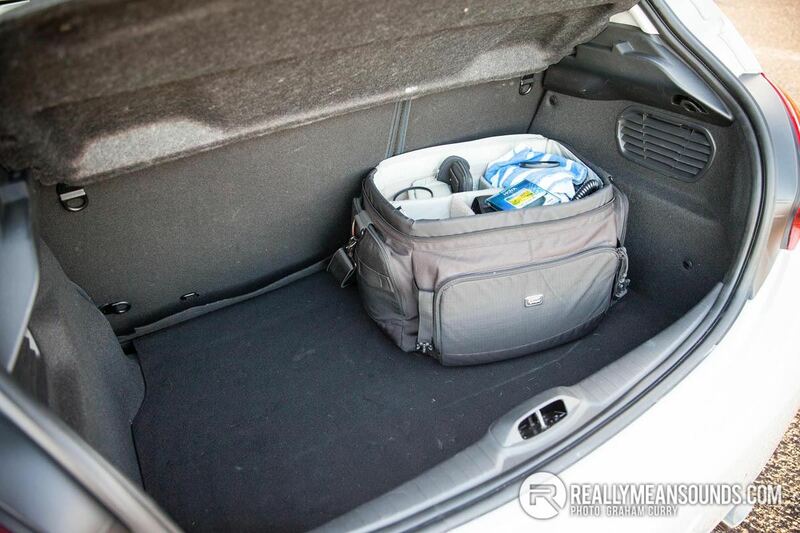 Opening the tailgate revealed a surprisingly usable and sizeable boot for this category and in fact even more surprisingly to me; I was able to fit all of my photography gear into the boot due to its practical width and height. 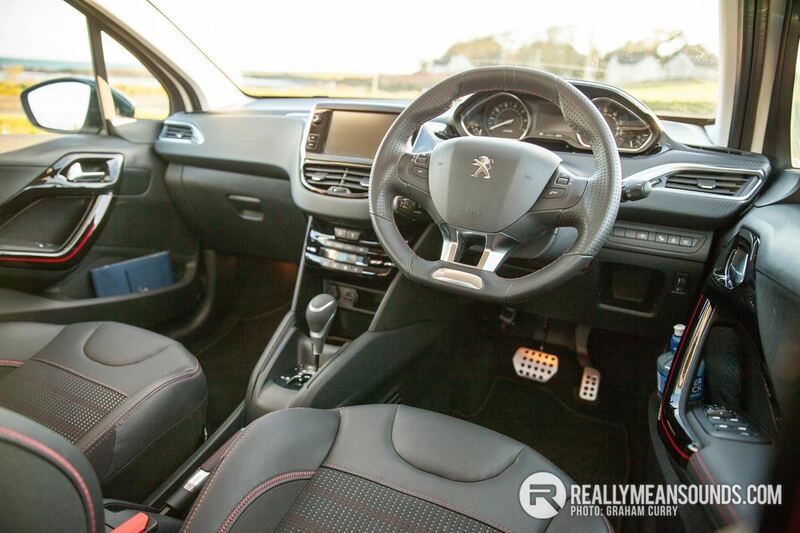 The rear seats are split fold and when utilising this standard feature, the Peugeot 208 becomes even more appealing for the active owner. Very young family life could be a squeeze with a large pram and a week’s shopping however with a foldable buggy for wobblers and toddlers the boot is ideal for the weekly shop or weekend road trip. 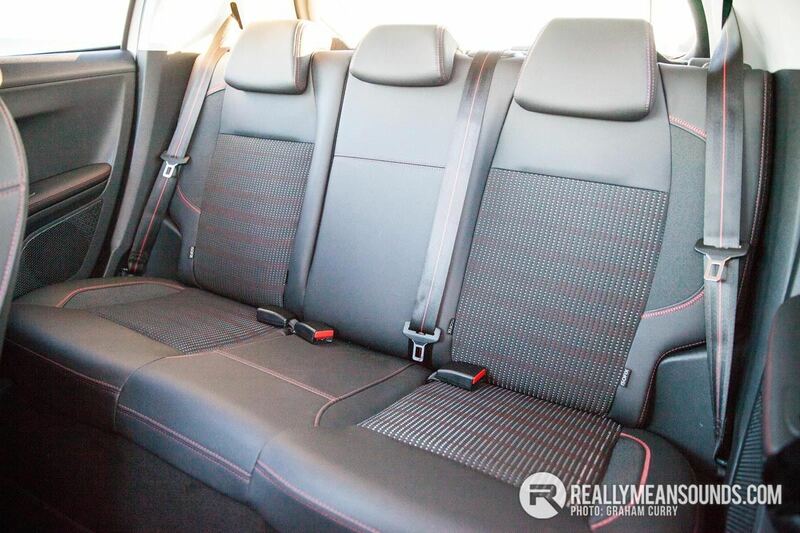 Inside the front seats have to be commended due to the sheer shape of them and the fact that they give all the support anyone would need in such a little “warm hatch” with great bolsters combined with huge comfort levels. Rear leg room is great for those under 5ft tall with those over feeling a little cramped on a long journey. The GT-Line sports detail continues inside with leather steering wheel with red stitching while the half leather seats, door cards and dash also received an abundance of the same red spool of thread. The seat belts and interior doors handles have even received a red stripe along them which was a fantastic little detail whilst alloy sill plates and pedals finished off the GT-Line spec. Infotainment in this test car was provided via a large touch screen system in the dash with the £400 navigation option as well as DAB radio, USB input etc as per most cars these days. The system itself was very simple and easy to use and pair my phone to and was equipped with the driving aid of rear assist including reverse camera (£500 option). The small, flat bottomed steering wheel annoyed me somewhat however on a personal level as I found the infotainment convenience buttons awkward to use on it and due to the small diameter of the steering wheel, once in my comfortable driving position, the digital speed read out was obscured by the top of the steering wheel. This 208 GT-Line was powered by a 1200cc turbocharged petrol engine which produces a more than respectable 110bhp with 151lb/ft of torque and matched to the six speed automatic gearbox in the test car was returning a combined economy of around 40mpg. With 0-60 mph in 9.8 seconds it was far from sluggish and around town was very punchy indeed. On the road the 208 handled great and was as smooth on a side road as it was on the motorway. One feature I found great with the test car was the automatic main light beam assist, that when driving in a non street lit area, would automatically turn the main beam on and then off again should another car or street lighting approach, a great automated safety feature. Over the week I had this Peugeot 208, the car grew on me greatly and the quality of the Peugeot brand has improved tenfold over the years, they have made them a nice place to be with huge amounts of technology and safety inside and for this particular car a bit of go, with great handling. With annual road tax at a mere £20/annum this little car is more than affordable and the test car with options came in at £17,695 while a base model five door can be bought from £12,295 with the range topping GTi model starting from £21,995. In summary I think the 208 GT-Line suits a vast array of owners from family life to the active and the retired will all feel at home and benefit from the many merits this lovely little car has.